From Colorado’s New Belgium Brewing, most famous for Fat Tire Ale, Juicy Watermelon is a watermelon lime ale. It’s got a light golden hue, a fizzy head that dissipates quickly, and it’s malt forward, so if you can’t find this brew locally, get yourself some Bud Light Lime, add a one quarter to one half ounce of watermelon juice, and you’ll have something reasonably close. The body is light to medium and the alcohol is a mild 5% ABV. I give it a 2 out of 5. This entry was posted in Reviews and tagged Colorado, Fruit Ale, Fruit Beer, New Belgium on December 7, 2018 by Xander. A sour brown ale of the Flanders Red style from New Belgium’s Lips of Faith series, the 2016 edition was aged in French oak for 1-3 years. The nose is light and musty. The middle is bright, very tart, and strongly apple flavored. There’s a bit of vanilla in the finish, presumably from the oak, but the sour apple still dominates. The body is medium to heavy and the alcohol is a pleasant 7.0% ABV. It isn’t terribly complex, but it is beautiful in its simplicity. 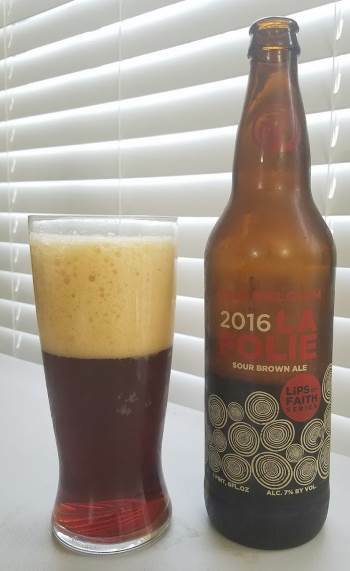 A sour brown ale of the Flanders Red style from New Belgium’s Lips of Faith series, the 2016 edition was aged in French oak for 1-3 years. The nose is light and musty. The middle is bright, very tart, and strongly apple flavored. There’s a bit of vanilla in the finish, presumably from the oak, but the sour apple still dominates. The body is medium to heavy and the alcohol is a pleasant 7.0% ABV. It isn’t terribly complex, but it is beautiful in its simplicity. This entry was posted in Reviews and tagged Ale, Belgian Ale, Belgian Sour, Colorado, Flanders Red, New Belgium, Red Ale, Sour, Sour Ale on August 3, 2017 by Xander. 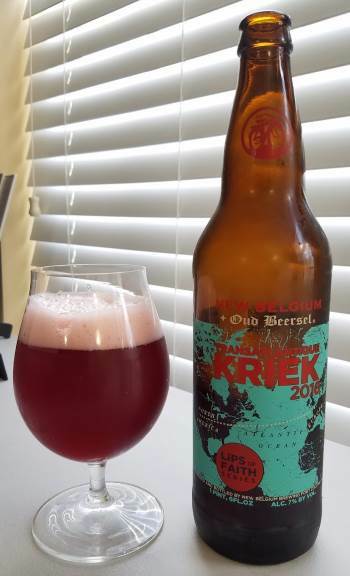 From New Belgium’s Lips of Faith series, Transatlantique Kriek is a wood-aged sour cherry ale. The result is a very bright, tart sour that is a deep ruby color in the glass. The nose is fairly mild with just a slight hint of cherry, and not much else. The middle explodes with tartness, and the cherries are subtle, or perhaps just overcome by the huge sour bite, but they are definitely there in the background, and come a bit forward in the finish. It’s fairly simple, without a lot of complexity, but a definitely a nice sour with a bit a fruit lambic flare. The body is medium and the alcohol is a moderate 7.0% ABV. This entry was posted in Reviews and tagged Ale, Belgian, Belgian Sour, Colorado, Lips of Faith, New Belgium, Sour on July 14, 2017 by Xander. It’s officially summer tomorrow, and time for a new crop of light, refreshing summer beers. 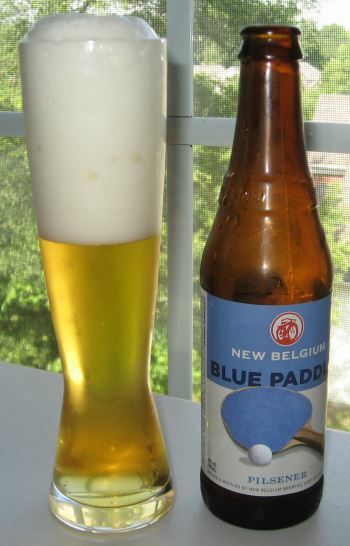 Blue Paddle from Colorado’s New Belgium Brewery fits that bill. It’s a Czech-style Pilsener and the first lagered beer New Belgium produced. The nose is grassy with peach and a bit of apricot. The middle is malty and has a surprisingly heavy body. Not too heavy, but I’d call it a medium bodied beer. There are notes of toast and grain and a very bready finish. This is a definitely a malt-forward beer, with the hop notes deep in the background. This is probably a bit rich and heavy to be a proper lawnmower beer, but it’s a properly good Czech Pilsner. 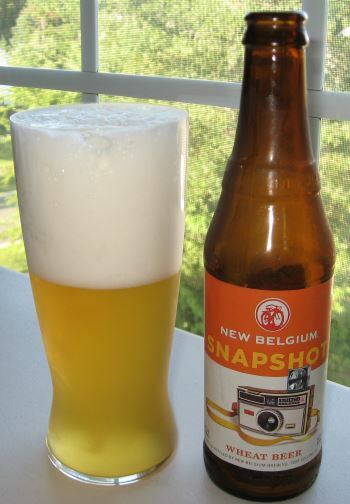 This entry was posted in Reviews and tagged Colorado, Czech Pilsner, Lager, New Belgium, Pilsner on June 20, 2014 by Xander. It’s bitterly cold here in Charlotte (read, below freezing) and so what better time to try a winter seasonal White IPA from New Belgium Brewing? 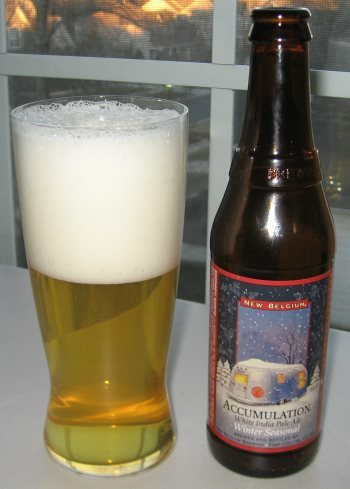 Accumulation is crisp and cold, and pretty spot on for what I expect of a white IPA. It’s very hop forward since there’s not a lot of maltiness from the wheat base to balance it out. The nose has pine and orange, the middle has more pine and lemon, and there’s a smooth breadiness to the finish with some strong citrus and herbal notes that remind me of thyme and rosemary. The body is fairly light, and the alcohol level is a fairly-standard-for-an-IPA 6.2% ABV. This is definitely hoppier and lighter than your average winter fare, but it’s a nice change of pace for those of us starting to go into hop withdrawal this time of year, and it’s quite well executed. I give it a 3.9 out of 5. This entry was posted in Reviews and tagged Colorado, IPA, New Belgium, Seasonal, Wheat Ale, White IPA, Winter Seasonal on January 24, 2014 by Xander. I love fall and winter, and I love fall and winter beers. 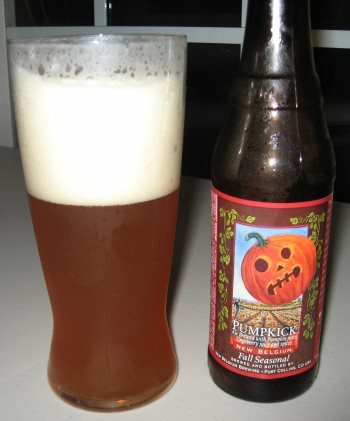 In this case, New Belgian’s fall seasonal pumpkin ale, Pumpkick. The nose is spicy with a bit of Belgian yeasty fruitiness. The middle is spicy pumpkin reminiscent of pie, and slightly sweet. The finish is tart, showcasing the cranberries this beer is brewed with, and a bit of citrus from lemongrass. None of the flavors are overpowering, and this medium-bodied ale has a very manageable alcohol level of 6% ABV. making it an excellent party or session beer. My bottom line is that this is a very nice, but not outstanding beer. This entry was posted in Reviews and tagged Colorado, Fall Seasonal, Fruit Beer, New Belgium, Pumpkin Ale, Seasonal on December 10, 2013 by Xander.